February 10, 2018, 4:49 PM · Applications are in for the second-ever Shanghai Isaac Stern International Violin Competition, which drew applications from 174 violinists from 33 countries/regions for this year's competition, up from 142 applicants from 26 countries/regions for the inaugural competition in 2016. In April, the competition will announce up to 36 applicants who will be invited to travel to Shanghai for the first round of the 2018 SISIVC. The competition will take place Aug. 10-Sept. 1 in Shanghai, offering considerable prizes, including top prize of $100,000. 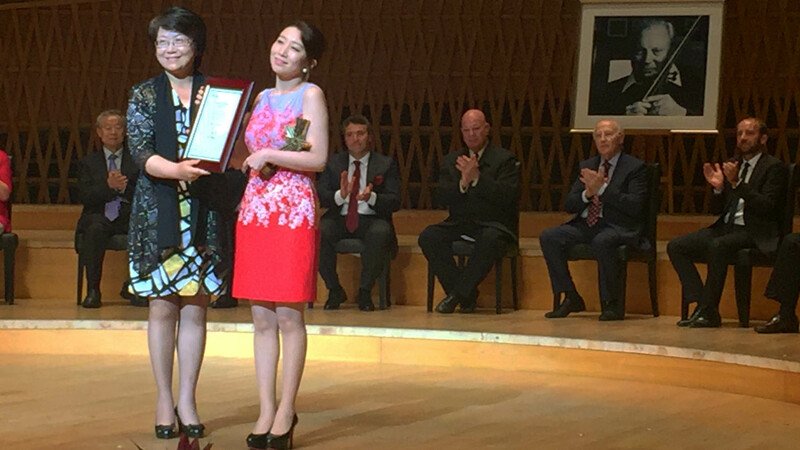 Mayu Kishima of Japan accepts First Prize at the inaugural Shanghai competition in 2016. This year the competition lowered its eligibility age from 18 to 16, with a top age of 32. Perhaps as a result, 65 percent of this year's applicants are under 25 years, and of those, nearly 68 percent are under the age of 20. Applicant countries/regions this year include: Australia, Azerbaijan, Bolivia, Canada, China, Czech, Ecuador, France, Georgia, Germany, Greece, Hong Kong (China), Ireland, Italy, Jamaica, Japan, Kazakhstan, Kenya, Latvia, Libya, Malaysia, Netherlands, Poland, Russia, South Korea, Spain, Sweden, Switzerland, Taiwan (China), Ukraine, United Kingdom, United States, and Vietnam. Among the music schools and institutions represented by this year's applicants are: The Juilliard School, Curtis Institute, New England Conservatory, Manhattan School of Music, Mannes School of Music, Cleveland Institute, Hochschule fur Musik "Hanns Eisler" Berlin, Moscow Tchaikovsky Institute, and others. Winners in the 2016 competition included first-prize winner Mayu Kishima of Japan, with Sergei Dogadin of Russia coming in second and Serena Huang of the United States third.